Notional Space, the name we give to our living room when it is transformed into a gathering place, is a gift economy project. Our aim is to provide a space where the people who are building community – artists, activists, nonprofits – can come together with those who are hungry for community and eager to support those working toward a more beautiful, meaningful, just world. 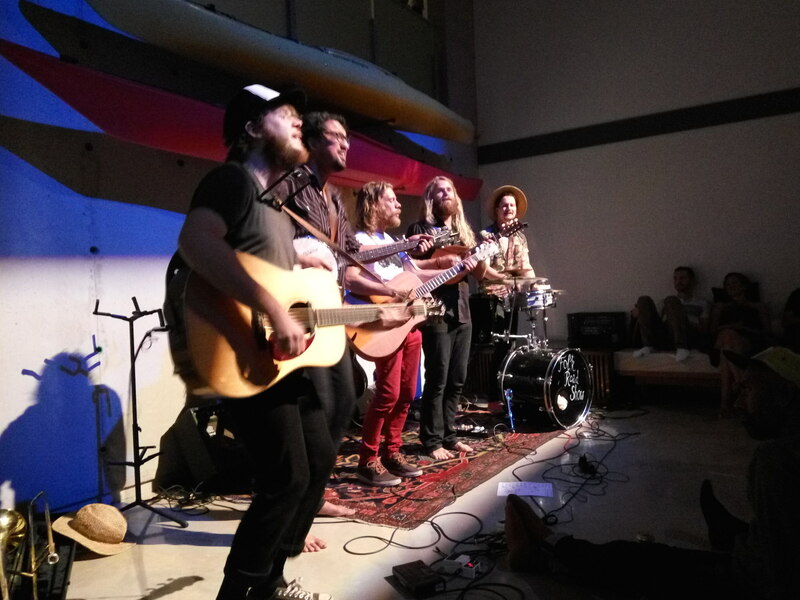 Frequently, this takes the form of “house concerts”, where you have a chance to see and hear outstanding performers representing a wide variety of musical genres. So we’ll discuss the gift economy dynamics in that context; but this analysis applies to any of the give as you wish events we host. Many people wonder: what’s so “gift economy” about these events, when they are giving money to be in the audience? How is this any different than any other commercial performance, where one buys a ticket to hear the music? It is easy to overlook the distinctions and it’s easy to see this as just another exchange of money for service; but this is to miss an important dynamic in these evenings. The phrases “pay it forward” or “pay as you wish” are frequently used within the gift economy context; but it is not language we favour. The language of “payment” roots the conversation firmly in the context of the marketplace, the context of transaction, the context of exchange. This is precisely the economic behaviour we wish to transcend. 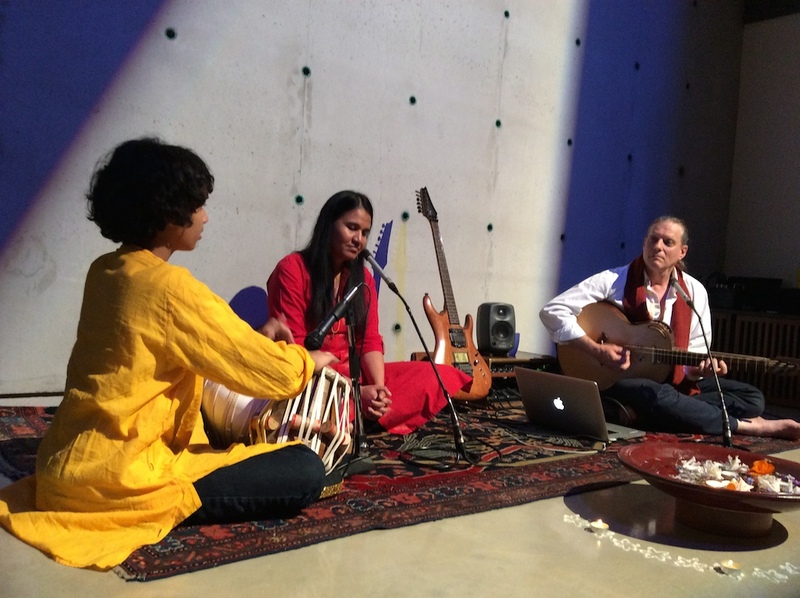 When you come to a performance at Notional Space, you “give as you wish”. Our intention is to signify that this is a fundamentally non-commercial event and it is entirely up to you to decide how you will contribute to the evening. We are providing you the opportunity to participate in the evening, both as recipient and as giver, and we are investing you with the agency to do so. We understand that it can be a strange shift of perspective to understand something you are used to “paying for” — like a seat at a concert — within the context of the gift economy; but it’s hardly rocket science. You may be moved to contribute by a feeling of gratitude to have been included in a special event. Or you may be inspired to help an artist along their way. Or perhaps you get a buzz from the opportunity to express your generosity. Or maybe you will have deduced that, if the artists who play at Notional Space feel chronically underappreciated, the place cannot sustain itself, and you are investing in the future of the community. Your precise motivation is not important. What is important is that your contribution comes from a spirit of participation, not transaction. We surely meet you halfway in this: we understand your contribution as a gift, for which we are grateful, not as an entitlement based on exchange. The hardest and most awkward part of the gift economy for neophytes is figuring-out how much they want to give. In a world where everything has a price tag, our ability to discern value has understandably atrophied. We are simply out-of-practice assessing the worth of goods, services, and experiences; and it is harder still to translate the kind of multidimensional evaluation we hope evenings at Notional Space warrant into a monetary calculation. 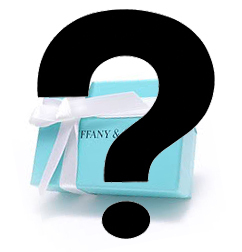 How do you decide how much to spend on a birthday present? Or a donation to your favoured charity? There is no easy answer because, of course, context is everything. Even if you are not able to transcend this kind of calculation, we are delighted that coming to an event at Notional Space gives you the opportunity decide on the value of the experience, rather than having it dictated to you. One of the lovely things about the gift economy is that you get to take responsibility and exercise autonomy to evaluate what this kind of experience is worth to you and contribute accordingly, no matter how you come to that decision. But you will have really captured the spirit when you find yourself completely disregarding assessments of market value and, instead, giving with the aim of delighting the recipient, just as you would with any other gift. The contribution you make may be very different than that the person sitting next to you. There are certain people we hope will give very little (or even nothing) when they come to “give as you wish” events at Notional Space: students on tight budgets, friends who have tenuous employment, or anyone struggling to make ends meet who might ordinarily miss-out on activities because they simply cannot afford it. But we hope everyone else will contribute generously. And it may well be that you have something to offer the artists or the Notional Space community other than (or in addition to) your money. The important thing is to understand that your place in Notional Space is as a participant, not as a customer. Folk Road Show play Notional Space. Where’s the gift in all this? There is gifting happening at many different levels of these evenings. The catalyzing gift comes from us. We are giving our time and opening our private space in order to make all of the other gifting possible. We are endeavouring to provide an environment where generosity can flourish. All proceeds from these evenings at Notional Space go to the artists, not to us. A more significant contribution is from the artists, who are foregoing the opportunity to deploy their talents at standard commercial establishments and are committed to a very different kind of interaction. They are creating a relatively rare chance for you to experience world-class live music in an intimate, convivial, fun space. They do not hide in the green room between sets or after the show; they are available to you to discuss their work and their process. They are allowing you to be a part of their creative experience in a way you can never be in a bar or typical music venue. The most important gifts come from you, both in terms of your presence and your contribution. You are supporting artists who, invariably, have chosen a difficult economic path in order to pursue their creative visions. Since we are the beneficiaries of the light and heat they bring to our community, we have a moral responsibility to nurture and sustain them – and to fairly reward work which all-too-frequently is undercompensated. Your contribution at the door goes directly to the artists. Indeed, it does not even pass through our hands. When you make a generous contribution, you are also supporting two other groups of people. We often have audience members who are extremely low on financial resources. You enable their attendance. Your larger offering is a way of allowing them to participate, while still making the evenings rewarding for the artists. The other group you are supporting with your gift is… well… all of us. These evenings only happen because you come, participate, enjoy yourself, and contribute. In an important way, we all (artists, audience, and hosts) make these magical events possible for each other. Without any one of these three legs, the experience fails. 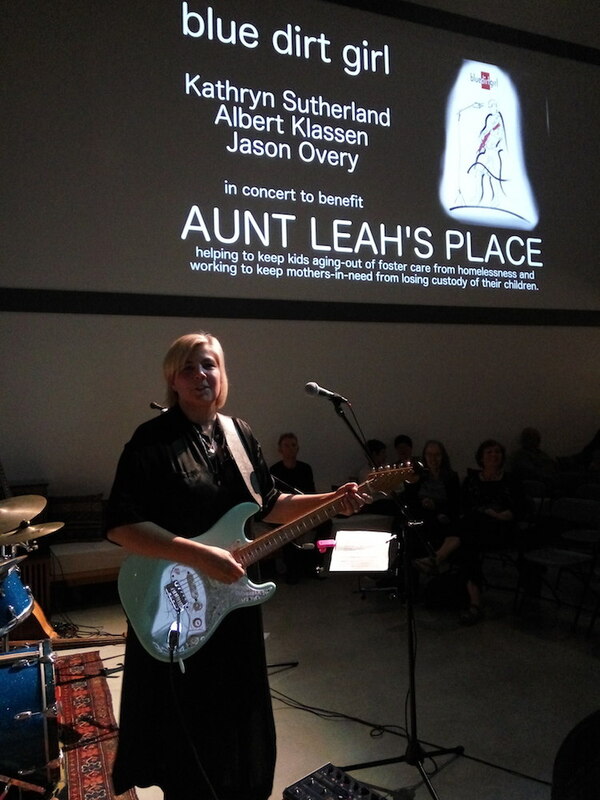 Kathryn Sutherland of Blue Dirt Girl, playing a benefit concert for Aunt Leah’s Place. The objective elements of an evening at Notional Space may look a lot like an exchange of money for music – but it’s the things we cannot see that create a fundamentally different dynamic. Something beautiful happens when all sides are participating from an attitude of generosity, rather than an unconsidered, we-pay-what-they-tell-us-to-pay and we-do-it-because-this-is-how-its-done adherence to an economic system that fails to serve or to develop the better angels of our nature. Learn more about the various forms of gift economy.